Are your scrapbooks calling you? The polymer photo pendants by Angie (HopeMoreStudio) tug at my heart. 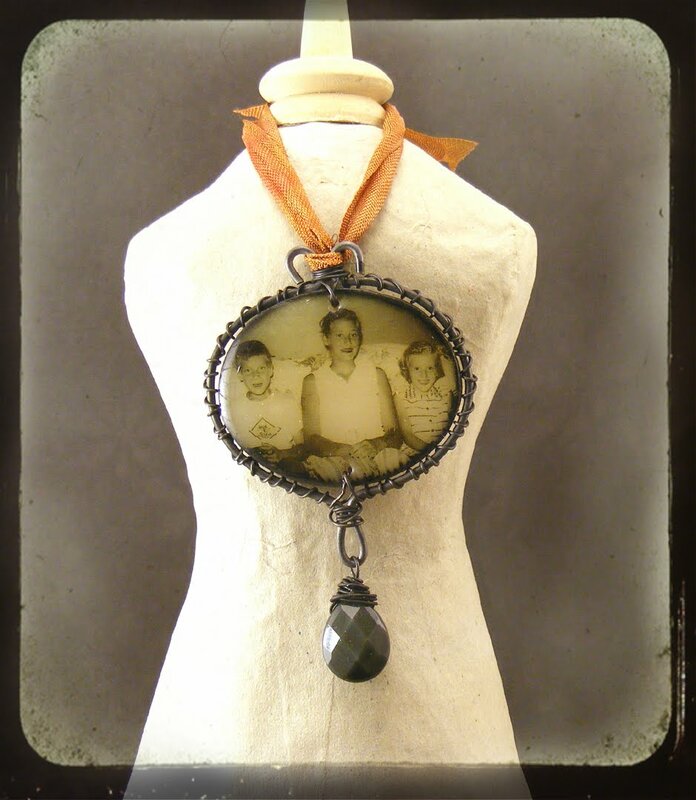 She adds bits of lace, ribbon, buttons and ephemera to family snapshots that turn them into sentimental treasures. Angie specializes in faux glass slides that capture a glimpse of another time and place….all polymer transfers that have been photoshopped, sepia-toned and topped with coats of shiny finish. They make me sigh with pleasure and nostalgia. Are your own scrapbooks begging to be given some studio love that will make them into pieces that can be worn, displayed and given the honor they deserve? Thanks to cyberhostess Alison Lee and all last night’s class participants. Teaching extrusions to students from Italy, UK, Mexico, Australia, Canada and my home town all from the comfort of my well-worn computer chair is mind boggling. Thank you! What lovely, unique, and nostalgic pieces. I really like the bits of adornments that decorate the pieces, too. Cynthia, Glad that your class was well attended and enjoyable. I agree, the concept of the cyber-classes is mind boggling. What beautiful work! It’s so unique and precious. Cynthia congratulations on your class!! woot!! Oh my gosh Cynthia I am blown away. I love, love, love your blog and I really do read it daily (when work doesn’t keep me away). I noticed a spike in my followers and it led me back to here.. all I can say is wow. Your comments are so sweet thank you!